Introduce or practice reading sight words with this FREE reproducible b&w reader! Each page in this predictable text follows the pattern, “I see a red ___”, including one page for students to complete the sentence and draw a picture. Even your youngest students can experience reading success! This booklet is a sample from Emergent Readers: Color Words, which includes both b&w and color booklets, plus pocket chart word cards for 10 color words. 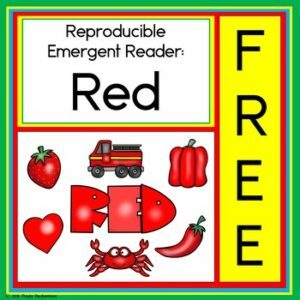 If you enjoy Emergent reader: red, you’ll love the whole set! Sight Word Mystery Pictures: Transportation.